I confuse to make my August 2017 cover. I don't have any idea at all. I need your help guys (somebody who read my post here)!!!! 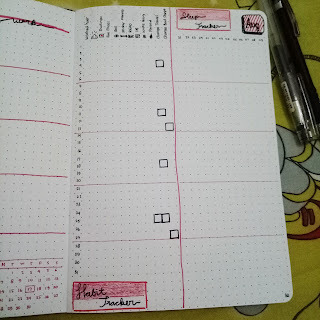 I have done my monthly log, habit tracker, sleep tracker, and my weekly layout for 1-6 Aug. But I still don't have any cover for August. Ugh! My August theme is Independence day because at Aug 17 is Independence day for Indonesia. I want to celebrate it on my journal. But I still don't have idea for my cover. I want to draw Garuda Pancasila but I think it's so difficult to draw Garuda. I have ever drawn Garuda on PROKM (like "ospek" in my Campus) as a nametag for me because the task is made a nametag with Garuda as a background. And my senior mocked me by saying "Itu Garuda apa ayam? (It's Garuda or Chicken?)" After that, I never drawn any kind of bird. (Orangnya mudah menyerah setelah diejek ). I separate it between personal and work. I forget to change the layout by place the date in the middle. Better do this next month. Hope I don't forget this. 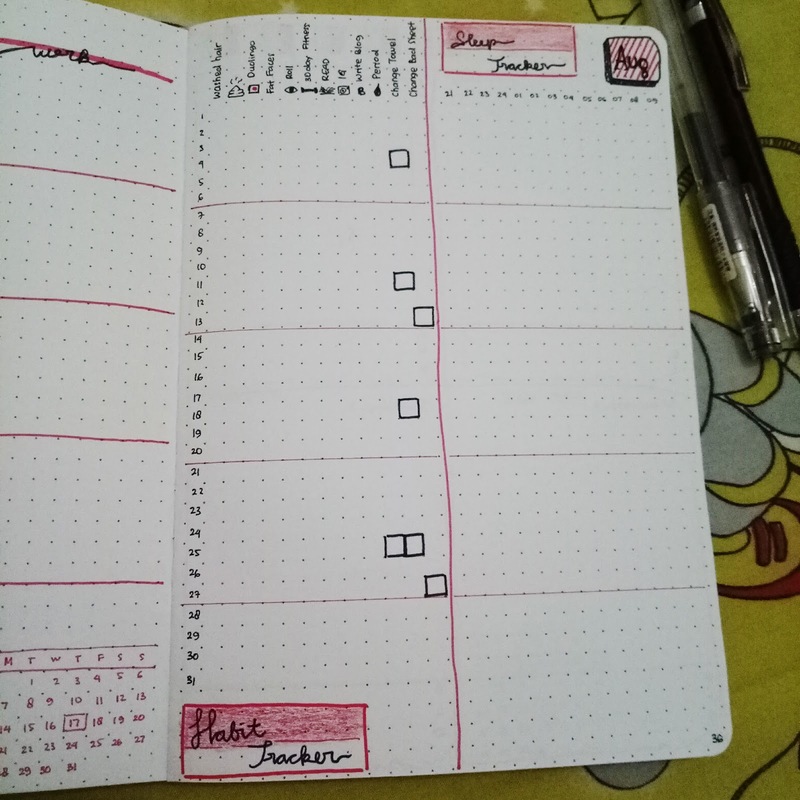 Next page is my habit tracker and sleep tracker. I made it horizontal so I don't have to rotate the book if I want to fill it. This month I don't make mood tracker because I think it's not work on me. I fill like everyday is a smile day or a flat day, so it's just a flat trend I get with just sometime a high and low pattern. So my mood tracker didn't work well and I just skip it for this month. 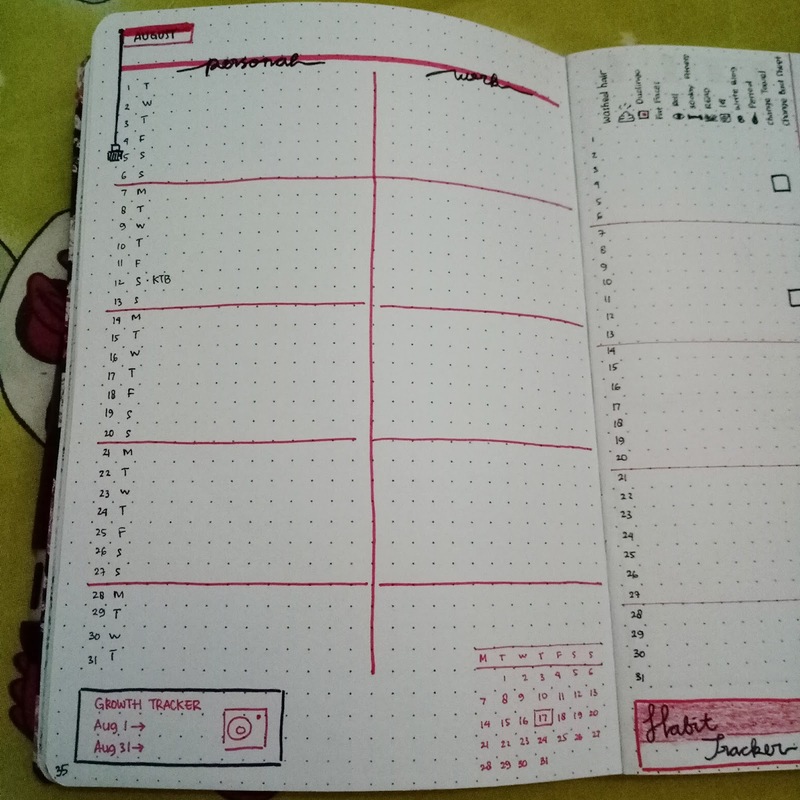 Next is my weekly layout. When I made this, I contemplate to choose between made it like my first weekly layout or just like the picture. Finally I chose to make it like that. I make a note "B L D" on the bottom of each day. It means Breakfast, Lunch, and Dinner. So I can see the overview of my food. I start to make a BLD from July and I think it's really good for me. 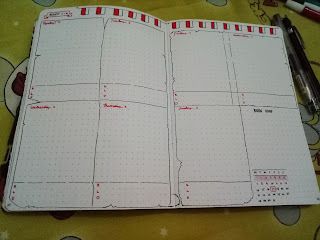 Overall, my August layout is full of red and white like my country flag, red white flag. Happy Independence Day Indonesia. I love this country and the history behind it. 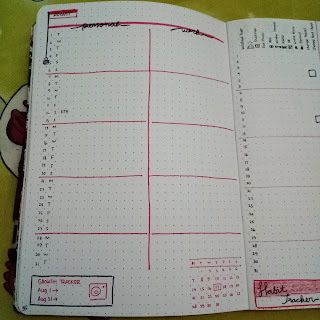 So, I hope I can make a good cover for my August log. Any idea from you guys? kalo garuda susah gambarnya :"